We recently had a birthday in the office and Amber from the Amber Dawn Bakery baked us these FABULOUS, moist and rich Phillips Longboat Chocolate Porter Cupcakes with Whiskey Buttercream Frosting. Believe us when we tell you, they tasted amazing and smelled so spectacular that we just had to ask Amber for her recipe, to share with our JustBeer Squad. Luckily enough, she was willing to let us in on her secret recipe. If you love beer and you love cupcakes and other sweet baked goods, you have to try out Amber Dawn Bakery’s amazing recipe on how to make Chocolate Porter Cupcakes. 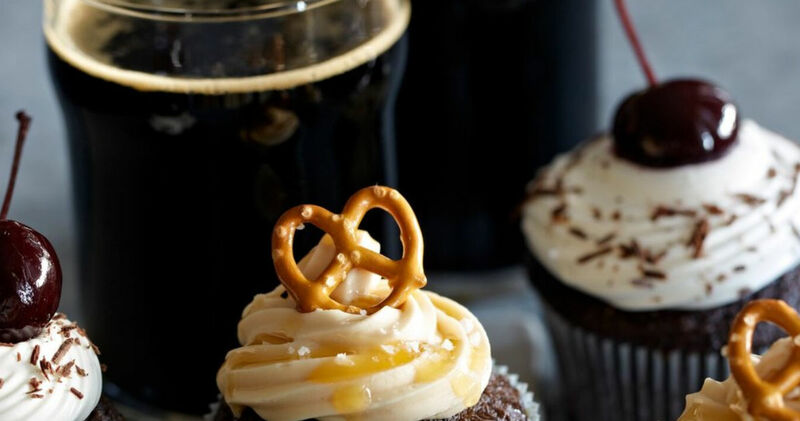 Switch out the Porter for a Stout in this recipe for delicious Chocolate Stout Cupcakes. Enjoy! Add wet ingredients. Stir to mix (careful not over mix!). If you have time, pour the porter 15-20 min beforehand so that it has less carbonation as it will be easier to mix. Scoop into paper lined cupcake tins, filling ¾ full. Bake for 18 min or until inserted wooden pick comes out clean. This recipe makes approximately 2 ¾ dozen chocolate cupcakes.